activation energy (Eact) – is the minimum energy that must be added to the reaction for a reaction to occur; on a reaction coordinate diagram, it corresponds to the energy required to go from the reactants up to the highest point in the energy diagram. Average rate: The rate over a period of time; this is calculated by taking two points on the concentration vs. time graph and dividing the change in concentration by the chage in time. Bimolecular: a term used to describe the elementary step involving two molecules 9or ions, atoms, or free radicals). Catalyst: a material that speeds up the reactiuon without being permanently changed in the reaction. Collision theory: a theory of chemical reaction rates that proposes that reactant molecules must collide with each other in order to react and that the molecules must collide with proper orientation and with sufficient energy. Elementary step: an individual step in a reaction mechanism. 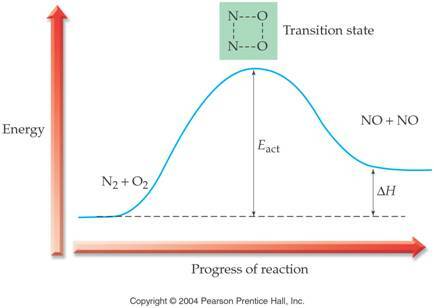 first order reactant – the rate of the reaction depends on the concentration of this reactant raised to the first power [A]1 or the rate of the reaction varies directly with a change in concentration of this reactant..
Half-life (t ½ ): the time required for the concentration of a reactant to decrease to half its initial value. Heterogeneous Catalyst – A catalyst that is present in a different phase from the reacting substances. Homogeneous Catalyst – A catalyst that is present in the same phase as the reacting substances. Initial rate: the instantaneous reaction rate at the start of a reaction. Instantaneous rate: the rate at a particular time: this is calculated by calculating the slope of the line tangent to the concentration vs. time graph at this time. Integrated rate law: An equation that relates the concentration and time; this equation is derived from the rate law using integral calculus. Intermediate (or reaction intermediate): a material that is produced in one step of a mechanism but is consumed in a later step. Molecularity: the number of reactant molecules (or ions, atoms, or free radicals) involved in an elementary step. order (of a reactant): the exponent to which a reactant’s concentration is raised in the rate law. Rate constant: the proportionality constant in the rate equation. Rate Determining Step (also Rate Limiting Step): The slowest step in a reaction mechanism and therefore the step that limits the overall reaction. Rate Equation (rate law): the mathematical relationship between reactant concentrations and the reaction rate. Reaction coordinate diagram: A diagram of which the y-axis is energy (or enthalpy) and the x-axis is a measure of the reaction’s progress. Reaction Mechanism: the sequence of bond-making and bond-breaking steps that occur during the conversion of reactants to products during a chemical reaction. 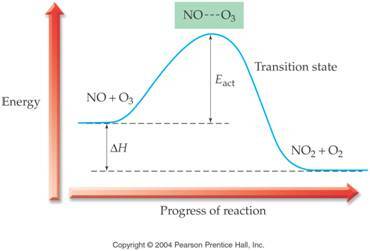 Reaction rate: The change in concentration of a substance divided by the change in time; if the material is a reactant, we must change the sign of this calculation. Termolecular: a term used to describe an elementary step involving three molecules (or ions, atoms, or free radicals); These steps are vary rare ( a three body collision). Total order: the sum of the exponents in a rate equation. Transition state: the chemical species present at the maximum in energy in a reaction coordinate diagram: it consists of atoms in some intermediate state of bond breaking and bond formation. Unimolecular: A term used to describe the elementary step involving only one molecule (*or ion, atom, or free radical).